Our Mission Escape Games Philadelphia host, Jose, began our adventure with a run through of the extensive and well rehearsed list of things we should not do while in the puzzle, it was pretty comical. “Do not use excessive force to move objects that are bolted into place” and “There is no need to explore unscrewing light bulbs or placing objects into electrical outlets” were the two most unsettling guidelines, because we knew that if he was saying it with a straight face to us, it had definitely, in all seriousness, happened. When prompted, he divulged that previous groups had actually torn the very panels off of the walls in a quite literal attempt to escape this room. This meant one of two things: 1- The drunken troglodytes that patronized this establishment lacked the intellect necessary to hunt for clues to solve puzzles. 2- This puzzle is so intense that it will drive you to illogical extremes. We were excited to begin. The premise of this room is based around the story of Dr. Jekyll and Mr. Hyde. The interactive narrative begins when you enter into Dr. Jekyll’s study, because a concerned friend has noticed he has gone missing and has hired you to find him. 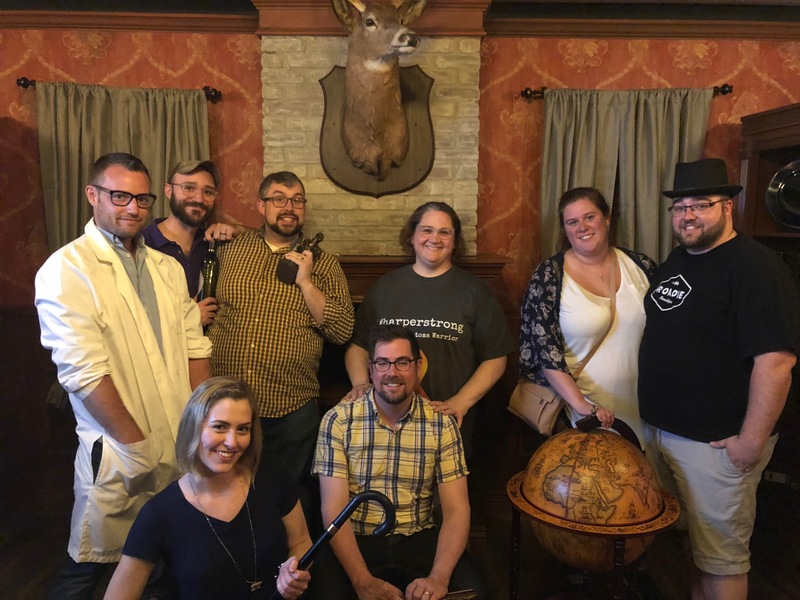 Without divulging too many details, I will say that the string of interconnected puzzles was far more cerebral than that of any other Escape Room situation any of us had experienced. They were extremely well thought out and delightfully difficult in a way that made solving them extremely satisfying. We endeavored to work with a team of eight friends from varying career fields and levels of education to broaden our chances at solving the riddles. This was the best move that we could have made, because each individual present contributed to our eventual completion of the test, and with only minutes to spare in our 1 hour of allotted time. While some of the clues we came upon were artfully crafted, there were just a few that seemed a little underwhelming (i.e.. two 8.5 x 11” sheets of modern day xerox paper with some numbers typed in standard Calibri font). In the wild fury to solve the puzzles, I didn’t particularly care or notice this as out of place, but in retrospect those details stick out. With crashes of thunder and lightning, and the obvious artistry that went into the creation of this room, I almost wonder if one of those tear the walls down groups didn’t destroy the original clues and these sheets were temporary stand in pieces. In any event, the game was a test of intrapersonal teamwork just as much as it was of critical thinking skills. Our group left that room feeling victorious and accomplished. Previous Product Review: A 10 calorie martini? Don’t mind if I do! Next Book Review: Arthur Chang’s Point of Virtue offers a unique point of view.